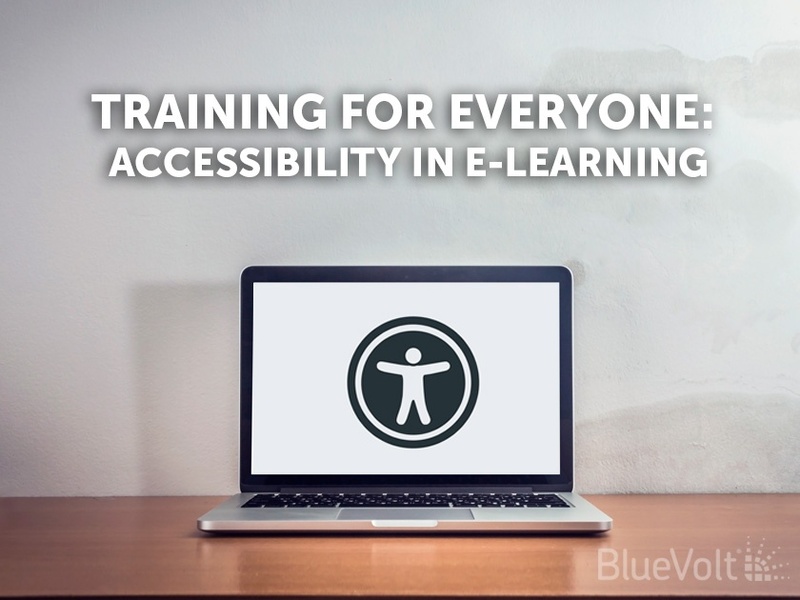 Making your LMS "accessible" means ensuring that all of your learners– even those with disabilities– can access and benefit from your online training program. Wayne Fidler, BlueVolt LMS UX Lead, discusses some key components of this multi-faceted topic below. What is the definition of "Accessibility?" According to the Wikipedia page, Accessibility refers to the design of products, devices, services, or environments for people who experience disabilities. The concept of accessible design and practice of accessible development ensures both "direct access" (i.e. unassisted) and "indirect access" meaning compatibility with a person's assistive technology. Accessibility focuses on enabling access for people with disabilities or special needs to enjoys the same benefits available to everyone. Accessibility starts with understanding how people with disabilities interact with technology. An accessible application doesn’t present content or interactions that rely on a single sense to communicate or instruct. For example, people who can’t hear (or don’t hear well), will have difficulty with audio cues. To make videos accessible to such people, you should not rely on button sounds, or you should add captions to the videos. Those with limited vision will need enough contrast between the text they are reading and the page background. Fully blind learners will be experiencing your content through the “lens” of a screen reader; for this audience colors and fonts mean nothing, and the beauty of a layout is in well-structured code that makes it easy to navigate a page with only a keyboard. Accessibility goes well beyond audio and visual impairments. Playback controls on timed slides give those with reading disorders the control to set their own pace. Limiting quick flashes protects those prone to seizures, and clear divisions between various parts of a page can help those with learning disabilities. So how do we know where to start when considering accessibility in digital design? Fortunately there are well-defined guidelines that take the guesswork out of the equation. In 1998 Congress added Section 508 to the Rehabilitation Act of 1973. This required all federal agencies to make their electronic information accessible in the same spirit as physical spaces. If your content is for a U.S. government entity, or accessibility is a legal requirement for your organization, you’ll want to comply with this legislation. In parallel to Section 508, the World Wide Web Consortium (W3C) has developed the Web Content Accessibility Guidelines, or WGAC. Now in its second iteration, WGAC 2.0 is a widely-used global standard geared for technology and content developers. There are 3 levels of compliance: A, AA, and AAA, and the guidelines are organized under 4 principles: making content and applications that are perceivable, operable, understandable, and robust. Mutual efforts to align over the years have led to Section 508 and WGAC 2.0 sharing many characteristics. One fundamental distinction to make, when planning for accessibility, is the difference between content and platform. LMS [Learning Management System] platforms enable learners to log in, consume training, and manage their account. Content comprises the course modules themselves, which may be uploaded to any number of systems. These two components require unique strategies to be accessible. Fortunately, many of the most common authoring tools, like Adobe Captivate and Articulate Storyline, offer extensive accessibility support. The same is true for many development frameworks, like Angular, which we use in the BlueVolt LMS. One major challenge to accessibility common to the entire web industry is the dilemma of aging technology. Content modules produced with Adobe Flash are particularly problematic; not only because of Flash’s accessibility issues but also because many companies have a significant volume of legacy Flash content that needs to be updated. Beyond the technical and tactical, elements of accessibility are a set of common sense best practices that benefit your entire audience, not just those with disabilities. Organizing your pages into a logical, top-down hierarchy of sections with headers will not only help those with screen readers; it will make learning easier and more intuitive for everyone. Simple and clear navigation helps everyone by enabling learners to find what they are looking for quickly. Practices like these, coupled with well-defined learning objectives, make for an effective training strategy, which is a major cornerstone of any successful enterprise. Ultimately, accessibility is good for people, good for business, and the right thing to do.